If you still need a calculator – apart from the one included into your Operating System – take a look at HPs „new” HP 35s. 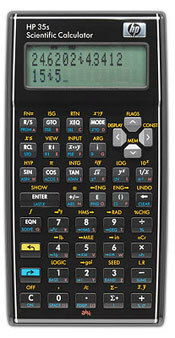 The anniversary model, celebrating 35 years since the company started producing scientific calculators, has the all too well known look of the original model. But under the hood, it packs a punch: RPN or algebraic entry-system logic, keystroke programming, HP Solve and 100 built-in functions, Large 2-line display with adjustable contrast, Single and two-variable statistics, linear regression and more, 30 KB of memory plus 800+ independent storage registers, Fraction mode plus fraction-to-decimal conversion, 42 built-in physical constants, plus a complete library of unit conversions, inverse functions, cube root, logarithms, exponents, factorials and more.